You may be thinking that, as an amateur photographer, I am writing about black and white photography. But, no - this is something much more tasty. 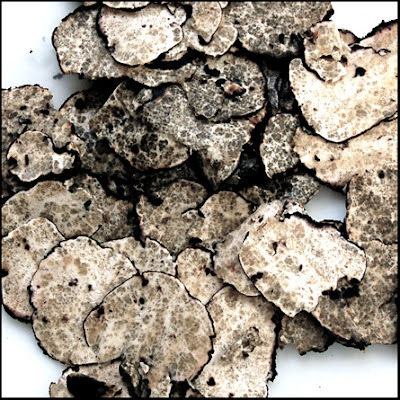 Black and white truffles! Of course, the title of this post did make me think of presenting all the photos in black and white. Instead, I have played around with the saturation and overall look, and had some fun making them almost black and white. This is Part One of two parts: Black Truffles. Really, in the end - or in the beginning for that matter - truffles are not much to look at. Resembling deep, intense black lumps of dirt, they are earthy smelling and tasting fungi that grow in the dirt in close proximity to the roots of trees - oak trees, to be specific. 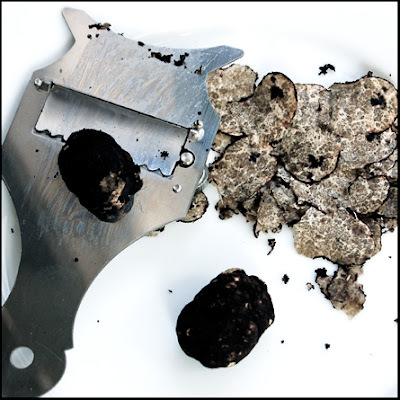 The root of the word truffle comes to us from the Latin tuber, meaning lump. How appropriate. 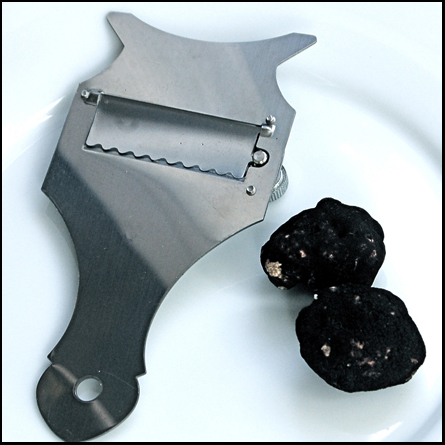 It morphed into tufer, which went on to become truffe in French, tartufo in Italian and truffle in English. The most famous of the French truffles come form the Périgord region of Southwest France, between Bordeaux and Toulouse. But there are many other regions in which they grow, including Provence, and during the autumn and winter there are numerous regional festivals celebrating these little black lumps. 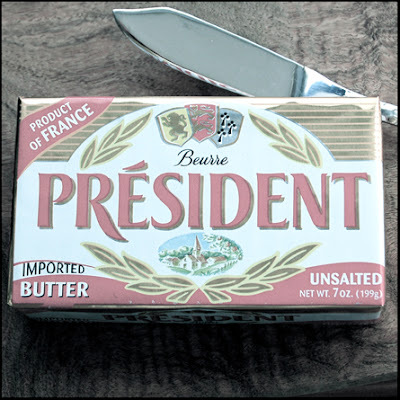 In fact, about 80% of the truffles grown in France come from the Southeast region. At this moment, I refer you back to Susan and Towny's blog, The Modern Trobadors, and specifically to their recent posting (Don't Forget Provence in the Winter) which discusses the different truffle festivals of Provence. Be sure to stay tuned for their upcoming post in which they go a-truffle-hunting with Artur. 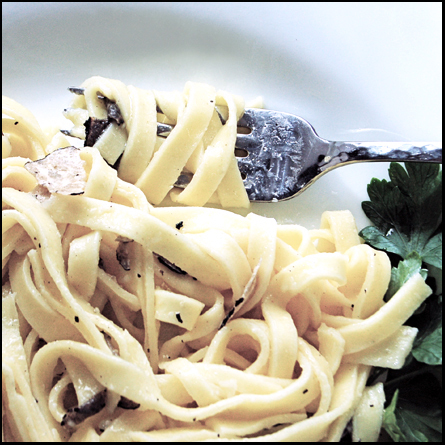 For his primo piatto, Mark ordered a pasta with wild mushrooms, as he was not such a fan of truffles at the time. I ordered the fettuccine with truffle cream and was transported to a higher place.... Mark tried it and agreed that it was exquisite. We returned later that week with our friends in tow for an evening to celebrate the end of a wonder-filled two weeks in Tuscany. Once again, for my primo piatto, I had the truffles and Mark followed suit. It was also, I might add, the first time either of us had ever had panna cotta, which came topped with frutta del bosco - woodland fruits. We returned to that restaurant in the spring two years later and, while neither of us had truffles (perhaps they were not on the menu that day? ), we had another great meal. Osteria del Tempo Perso will always remain a favorite place in our hearts. This morning, after talking with Susan and Towny, Mark and I walked to our local epicurean grocery and picked up some really nice black truffles and some French butter to make pasta for our midday dinner. 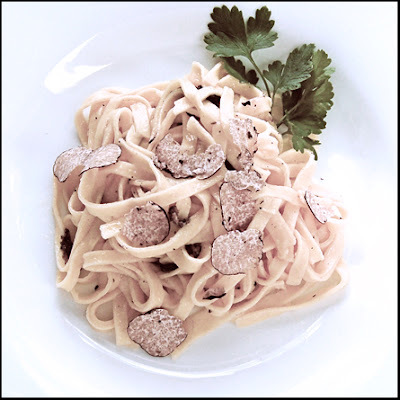 This is a truly lovely and simple preparation if you can find fresh truffles, especially those imported form France. (You can expect to pay dearly for these little lumps - but they are worth every penny! And, on the bright side, they are a bargain compared to the white variety!) I didn't ask about the prevenance of our truffles but must assume they are from Oregon, based on the price. The recipe is inspired by a Patricia Wells recipe. Bring a large pot of water to a boil for the pasta. 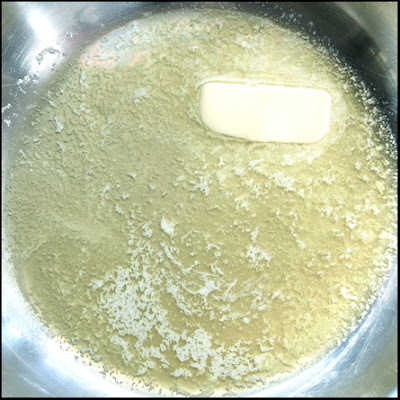 As it nears the boil, melt the butter in a large skillet over low heat - it should not get enough for the butter to sputter. Using a truffle slicer*, slice one of the truffles and half the second into the melted butter, reserving the final half for presentation. 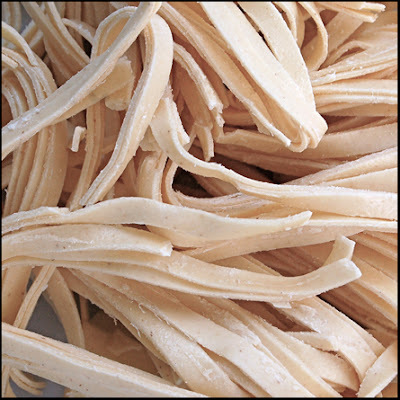 Add 2 tablespoons salt to the boiling water and cook the pasta until al dente; drain in a colander. Add cooked pasta to the butter-truffle mixture and toss, adding a tiny amount of salt to season. Serve immediately, and enjoy with a glass of chilled Pouilly-Fuissé. * Note: If you do not have a truffle slicer, you can slice some with a sharp knife for presentation and mince the rest of them to add to the butter.